Recently, many investors have been inquiring about strategies to diversify their fixed-income exposure away from interest-rate and corporate-credit sensitive sectors. Rising rates have become a renewed concern, with the Fed, ECB, and other central banks across the globe either preparing or taking active steps to tighten monetary policy. Additionally, corporate credit spreads have compressed significantly over the past 24 months, with valuations that look fair to fundamentals but not overwhelmingly attractive. 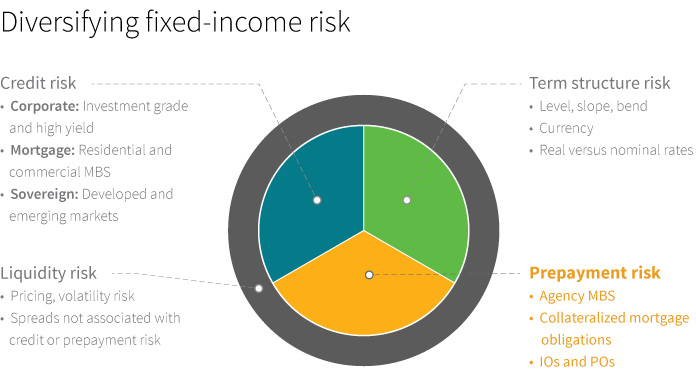 We believe that investors can generally diversify fixed-income exposure across four main types of risk: interest rate (or term structure), credit, prepayment, and liquidity. Of these, we believe prepayment risk, which is typically associated with U.S. mortgage-backed securities, particularly the agency interest-only (IO) sector, may be underrepresented as a risk premium in most global investors’ fixed-income portfolios. Agency IOs tend to receive less attention from investors due to the sector’s small size and the specialization required to extract value. However, we believe this segment of the market offers exposure to a risk premium that can complement a government or corporate credit portfolio as well as provide significant diversification benefits. One of the unique features about agency IOs is that the sector has historically performed better in rising-interest-rate environments. U.S. homeowners, who have the option to prepay their mortgage at any time, lose incentive to refinance as rates go up. Therefore, the expectation is that the agency IO holder will receive interest payments for a longer period of time, generating a better-than-expected return on the investment. The most prominent example of the diversification benefit of agency IOs occurred during the May–June 2013 “taper tantrum” in the United States, as fears that the Federal Reserve was beginning to unwind its extraordinary accommodative policy measures led to rapidly rising rates and flows out of fixed income. During that month of June, both interest-rate and credit-sensitive strategies generally underperformed, while Agency IO was the only sector to experience positive excess returns in relation to Treasuries. Agency IOs may also be a good diversifier to other components of an allocator’s portfolio, such as equities, high yield, and emerging markets. In addition, the sector has demonstrated low correlation versus other types of securitized products. The low correlations result from a different type of risk premium. The agency IO sector is driven by prepayment trends — that is, the propensity of U.S. homeowners to prepay their mortgage. The factors that drive the homeowner’s incentive to prepay are independent of factors that drive the corporate or sovereign balance sheet. We believe prepayment risk plays a role in a well-diversified fixed-income portfolio, and it has proven to be attractive historically in periods of rising interest rates similar to what we see in today’s markets. Past performance is not a guarantee of future results. Diversification does not assure a profit or protect against loss. 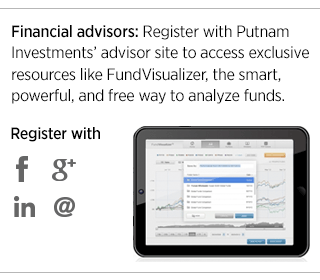 It is possible to lose money in a diversified portfolio. Mortgage-backed securities are subject to prepayment risk and the risk they may increase in value less than other bonds when interest rates decline and decline in value more than other bonds when interest rates rise. An investment in mortgage-backed securities and asset-backed securities may be or become illiquid. Mr. Costello is a Senior Investment Director in the Global Investment Strategies group, specializing in various fixed income strategies, including core, securitized, global, and nontraditional bond portfolios.